Volunteers from The State of Missouri have donated over 17,500 hours assisting in the transcription of the birth and death records for the state. The Birth records database contains transcribed records that are from 1883 - 1893. The transribed birth records consist of the birth date and place, Mother's maiden name, Father's name, occupation, and both parents age, nationality and birth place. The Death records are available for the time period of 1883- 1893 and 1910 - 1955. Transcribed information contained in the Death record data base include, name, death date, time, and place; cause of death, nationality, place of birth, date and place of burial. 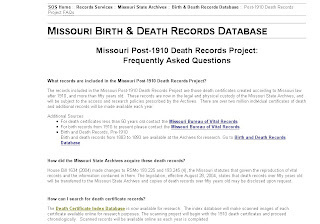 If you would like to view the data base, please click here and you will be redirected to the Missouri Brith and Death On-Line Datbase. In all cases, the website recommends that the researcher request a copy of the original document due to the fact that their might be transcription errors of these documents. One of the many nice features of this site is that you can send a email requesting information and the staff will search for you within certain parameters. Once they have completed their search, they will send a return email with the specifics of the copy fees. If you would like to view the specific requirements for this service, click here.